The Huawei Ascent G7 is a well designed smartphone that packs some nice features and excellent battery life. Fast 4G mobile data and a decent camera are both highlights, and it has a very reasonable price tag. Huawei is the third biggest global smartphone maker, but outside of its native China the brand name doesn't carry that much weight – especially when it comes to premium products. Apple and Samsung seem to have that corner almost all to themselves, and despite its successes, Huawei somehow hasn't managed to shake off its cheap also-ran reputation. 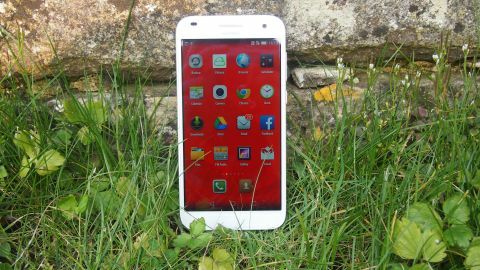 Huawei hopes to rise above its somewhat unfairly earned reputation with the appropriately named Huawei Ascend G7, a stylishly designed smartphone that packs in some of the latest features but without a huge price tag. Retailing for £199 (around $296, AU$385), the Ascend G7 comes in at a fair bit cheaper than the Huawei Ascend P7, which launched at £370 ($625, AU$690); compared to phones from more established brands (in the West at least), on paper the Ascend G7 looks a steal. The midrange market is a competitive and crowded one, with the Ascend G7's closest rivals being the HTC Desire 816 and the OnePlus One, which both offer high specifications for low prices, proving that you don't have to pay premium prices for premium features. So has Huawei managed to create the Holy Grail of smartphones by combining premium features and design with an affordable price tag in the Ascend G7, while simultaneously improving its standing in the eyes of Western customers? The Ascend G7 certainly has a lot to live up to. Huawei has obviously lavished a lot of care and attention on the Ascend G7, as this is an impressive looking device considering the price. Obvious design cues have been taken from the iPhone 6, with the rounded edges and premium-feeling metal back. "Ooh it looks a bit like an iPhone 6" will likely be a lot of people's first impression when you flash the Ascend G7 down the pub, and I feel that this could be both a blessing and a curse. The stylish design certainly puts the Ascend G7 ahead of the HTC Desire 816 and even the OnePlus One, but will the people you show it to be impressed with a smartphone that looks a bit like an iPhone, but isn't really one? Most people will probably just comment that it looks like a cheap Chinese knock-off, which in a way it is, but that also does a disservice to the Ascend G7, which does a lot more than simply rip off Apple. Although I really like the look of the Ascend G7, I can't help but feel that if Huawei had gone for a design that, while stylish didn't quite invite comparisons to Apple's flagship as much as it currently does, the handset would have a better chance of stepping out from the iPhone's shadow. The metal unibody not only looks premium, but also feels premium. It has a weight that feels far from cheap, and the solid build quality gives you confidence that you could safely take the Ascend G7 out and about with you. The metal unibody does contribute to the weight of the handset, with the scales tipping at 165g with a 5.5-inch screen and body dimensions of 153.5 x 77.3 x 7.6 mm, so this is definitely a handset that you'll notice when you carry it around in your pocket. Still, the heft of the Ascend G7 means that you don't have to worry about any bendgate shenanigans, with the 7.6mm thickness of the handset giving it a reassuring sturdiness, while still remaining rather impressively thin. The power button and volume rocker are located on the right-hand side of the handset within easy reach, and considering the size of the screen I'm pleased that the power button isn't placed on the top of the handset, as it would be a bit more of an uncomfortable stretch to reach it. Alongside the power and volume controls are a tray for a SIM card and a microSD slot, and the designs are flush with the edge of the Ascend G7's body, which again helps give the handset a premium feel. It does, however, also mean that you'll need a pin to insert into the small holes to eject the trays, which can make swapping out SIMs and microSD cards a bit fiddly. The entire body of the Ascend G7 is sealed shut, which some people might see as an unwelcome influence from Apple, so there's no easy way to gain access to the G7's 3000mAh battery to replace it if the battery life drops drastically. Overall, the design of the Ascend G7 is a clear improvement over Huawei's previous smartphones, and although it won't trouble the aesthetically-blessed iPhone 6 or Samsung Galaxy S6, it is one of the nicest looking phones for its price range, and you won't be embarrassed to take this budget smartphone out in public.